An increased prominence of guitars in the band makes Bob’s World War II and post-war music very interesting. It’s different from the pre-war, especially the pre-Eldon, music. For one thing, it was a smaller group, back to the size Bob worked with when he first went to Tulsa or even or a little smaller. 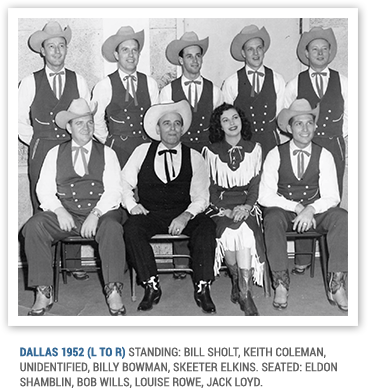 Fiddles continued to play the dominant role, and Bob had some great fiddlers in this period, including the flashy left-handed fiddler Joe Holley, the very smooth Keith Coleman, and the remarkable Johnny Gimble. Like Shamblin, Gimble was thought of as a musician who made everybody else he played with play better. This was far from the “fiddle band” format Bob started out with, though, in large part because of the prominence of guitars. Eldon Shamblin deserves a lot of the credit for this change, but Bob also hired a remarkable string of other guitarists in the late war years and postwar period. Before the war was over, he had Cameron Hill and Jimmy Wyble, whose work on “Roly Poly” from January 1945 is very exciting. He had the incomparable Lester Barnard Jr., whose “dirty, low-down” style seemed shocking to some of Bob’s fans but whose playing Bob liked a lot. He also had some very talented steel guitarists, Noel Boggs and Herb Remington, to name just two, whose solos and interplay with the “standard” guitarists added greatly to the power of those instruments and the drive they gave Bob’s music. But a quick listen to “Brain Cloudy Blues” from 1946 and Junior Barnard’s amazing guitar solo will convince anyone that Bob’s creativity, willingness to experiment, and determination to drive forward into a bright musical future were all undiminished. “Brain Cloudy Blues” and other songs from the post-war period were recorded in California, which became Bob’s base of operations for a number of years. He played there, toured from there, and did shows in Las Vegas and elsewhere in the West. He took advantage of the post-war economic boom on the West Coast and the presence of countless fans who knew his music. Many of these people had gone west during the Great Depression or ended up there because of military service or defense work. 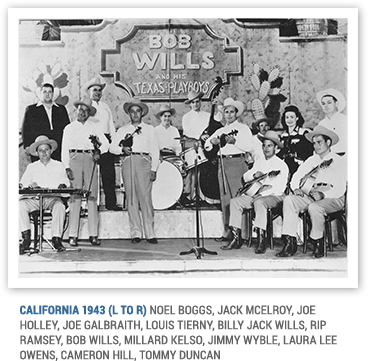 A lot of them enjoyed going to Bob Wills dances in California, and many heard his music increasingly in stage shows in Las Vegas. He never abandoned dances but increasingly split his time between the dancehall and the concert stage.